The Imperial Palace Easter Garden(皇居東御苑, kokyohigashigyoen) is also the ruins of Edo Castle(江戸城). It was the Honmaru and Ooku was located during the Edo period. It was used to be the center of Tokugawa Government and the castle of Tokugawa Shogun. After the Meiji Restoration, it becomes the Imperial Palace of Japan. The eastern garden is the part of the palace where opens for public. There are beautiful Japanese gardens and many ruins of Edo Castle, such as the gate, stone walls, moat and houses are still existed. Opens: Tuesday, Wednesday and Thursday from 9:00 to 16:00 (in summer, opens till 17:00. No admission fee. Notice: This is the part of the Imperial Palace, so there are many police watching any kinds of activities. There is no party, or exercise allowed in the garden. Please keep the great manner and stay away from the restricted area when you visit here. Edo Castle was originally built in 1457. It was called Chiyoda Castle at that time. After the battle of Sekigahara, Tokugawa Ieyasu started to built the great castle used all money of Daimyo, and it was completed by the time of Iemitsu. It has the 16km entourage which makes Edo Castle the biggest castle of Japan. The Tenshu had 5 layers 5 stories high but, after the fire accident in 1657, they never rebuilt Tenshu. There are 4 layers moats and 19 keeps to protect Shogun. The Entire structures has Honmaru, Ninomaru, Sannomaru, Nishinomaru, Kitaonmaru, Fukiage, Oteshita, Nishinomaru-shita, and Daimyokouji. ... is the main entrance of Edo Castle where Shogun used. 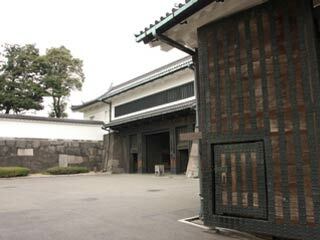 ... was the biggest guardhouse set up infront of the Ote-san-no-mon gate leading to Honmaru and Ninomaru, for inspection of visitors who entered from Ote-mon gate in the Edo Period. One hundred samurai guardsmen, chosen from among the Kinsmen and loyal retainers of each of the four main branches of Tokugawa clan, had their quarters there and worked in shifts day and night. ... was one of the remaining keep from Edo Period. It is three storied keep, but after the lost of Tenshu this keep was the temp Tenshu during the Edo period. Tokugawa shogun used enjoy fireworks from this keep. ... consisted of three sections, namely, Omote, Nakaoku and Ohoku. Omote was the stage for general public ceremonies, and the place of work for various government officials of Tokugawa Government. Nakaoku was where the shogun lived his everyday life and administered the affairs of state. Ohoku was where the shogun's family, including the wife of shogun called Midaidokoro, lived, and where other ladies or female staffs also lived. ...is characterized by Obikurawa enclosure which extended to the Hirakawabori Moat. It was constructed long and slender so that the enemies who invaded from the Takebashimon-gate could be repulsed on Obikuruwa enclosure. The criminals and dead were pulled out from this gate. That is why this gate was called Fujyomon gate, means impurity. The Eastern Garden of the Imperial Palace lie adjacent to Their Majesties the Emperor and Empress's residential quarter. The gardens offers opportunities for visitors to appreciate a wide variety of trees and flowers in four seasons. ... is a garden based on a 18th century garden map. A pond can be found today in nearly the same position as the original garden attributed to Kobori Enshu. ... was created following the suggestion by the Emperor Showa as an area reminiscent of woodlands which had been disappearing in and around Tokyo.